Ideal location and everything was perfect...will be back next year! Truly enjoyed it. We had a big group (15) and it was very comfortable. Excellent property very happy the spa was serviced a couple of times during our stay. What a great stay we had! 5 days 4 nights in this beauty property. Everything was meticulous. From the comfy beads and well stocked kitchen to the lotions and bath products. The steam shower was a huge hit and a welcome treat after a long day on the slopes. Concierge 38 took care of everything we needed. We had great meals at Tomboy, There(!!!) and The Village Table. Great stay. Definitely recommend! Great property and great team to work with!! Meghan was awesome!!! 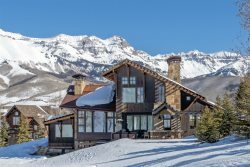 "The Best Place to Stay in Telluride!" My family and I have been visiting Telluride for years, and this is by far our favorite place to stay when we visit! The condo has breathtaking views of the mountains, is beautifully decorated, very spacious, clean, and stocked with all the essentials every time we arrive. It's rustic and cozy, but modern and elegant, exactly what we are looking for in a mountain getaway. It's our home away from home! The property, Cassidy Ridge, is stunning, private, and luxurious. It's also centrally located with shops and restaurants nearby, and the best part is there's a complimentary shuttle ready to pick you up and take you where you're going within minutes. As avid skiers, it's important that we're able to hit the slopes as quickly and conveniently as possible each day. With the Latitude 38 service that is offered, grabbing our ski gear and getting to the slopes early while the powder is untouched is a breeze. It's the best! Every time we stay here we are well taken care of, relaxed, and able to enjoy our trip to the fullest. We'll never stay anywhere else. A+, have rented many places and this was the best experience start to finish we have ever had. Wonderful location and price point...Thank you! Thoroughly enjoyed our stay at Lulu City 3 G. Very well-equipped condo. Loved the one level floor plan. Excellent location. Great management company. Everything was perfect. We will use Lattitude 38 again.